Rainbow Rapidash is the evolved form of Rainbow Ponyta, a rare, Battle Arena exclusive Pokemon which was one of the first Pokemon to be made obtainable through donation. In order to obtain the Rainbow Ponyta, a donation was to be made to Pokemon Battle Arena, and the Pokemon would be given as a gift in the Pokemon PC. Unfortunately Rainbow Ponyta is no longer available through donation but may be caught through its appearances on Route 7. Another, arguably easier way to obtain these elusive Pokemon. 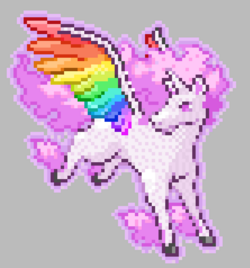 It is unknown whether Rainbow Rapidash has any stats or type benefites attributed to it that differ from it's natural species or if its colour is the only truely unusual thing about it. Pokemon Crater Wiki is a FANDOM Games Community.